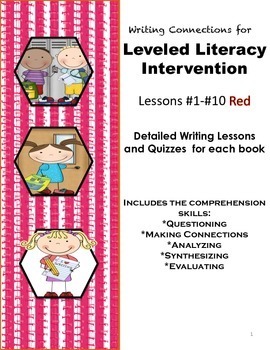 Detailed writing lessons and quizzes for Red Leveled Literacy Intervention books #1-#10 are provided in this product. Teachers find the book Readers Writing (Elizabeth Hale) a "must have" for teaching students to think critically in order to write quality independent entries in their Writer’s Notebook . Pairing these books in this unit will provide you with explicit examples for thinking critically about text through writing. These lessons are not only easy to teach, but can be used with students of all abilities. Writing was our main objective, however, we could not resist opportunities for higher level thinking, student engagement, discussion generators, and activities for individual accountability for learning. 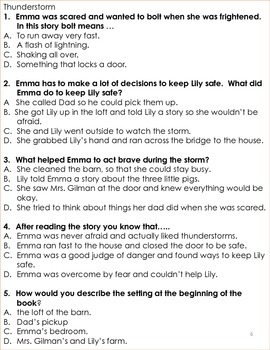 After using these materials in our classroom, we have seen comprehension and reflective writing improve for all of our students. 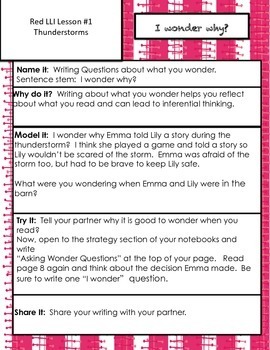 Also included are comprehension checks/tests and answer sheets for each book. 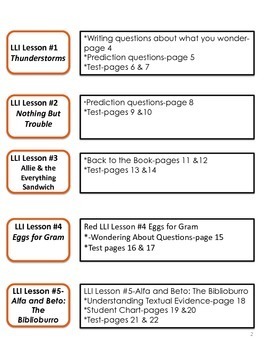 If you love Leveled Learning Intervention, you will find this download beneficial and READY TO USE TOMORROW. 11 pages are included in this FREE download.